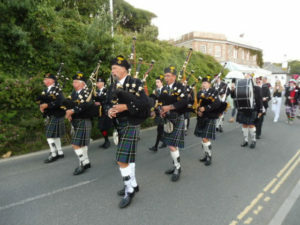 To book Kernow Pipes and Drums for your event, contact the booking secretary by email. To enquire about joining the band, as either a piper or drummer, contact our Pipe Major, Nigel Warmington, by email. You can also contact us via our Facebook page. The practice rooms are within the secured compound of 6th Rifles Drill Hall with access controlled by a keypad lock on a pedestrian access gate. Please do not use the door bells for calling the caretaker for entry. Anyone wishing to join or visit the Band should first contact the band as above.